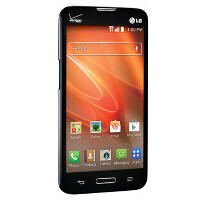 Verizon has taken the LG L70 and has re-branded it as the LG Optimus Exceed 2. The phone is available now for Big Red's pre-paid customers, at a price of $59.99 without a two-year contract. The device features a 4.5 inch screen with resolution of 480 x 800. A dual-core 1.2GHz CPU is under the hood, with 1GB of RAM and 4GB of native storage on board. A 32GB microSD slot can give you additional storage capacity if needed. Rear and front-facing cameras weigh in at 5MPand .3MP respectively. A 2100mAh battery powers the phone, which comes out of the box with Android 4.4 pre-installed. The LG Optimus Exceed 2 carries a ton of LG's features such as Knock Code. This allows you to set a pattern of up to 8 taps you can use to unlock the device. KnockON allows you to double tap your phone to put it to sleep and to wake it. Also included is the multitasking feature QSlide. With this feature, you can use two applications at the same time by overlaying one screen on top of another. Slide the QSlide bar to adjust how translucent each app is. And Quick Memo lets you take a screenshot from your phone, use your finger to mark it up with drawings or messages, and send it off via email or by social media, to your friends or family. The LG L70 has been available from MetroPCS since late last month. After a $100 rebate, the device is priced at $49 and can be purchased from MetroPCS online or at the pre-paid carrier's retail stores. 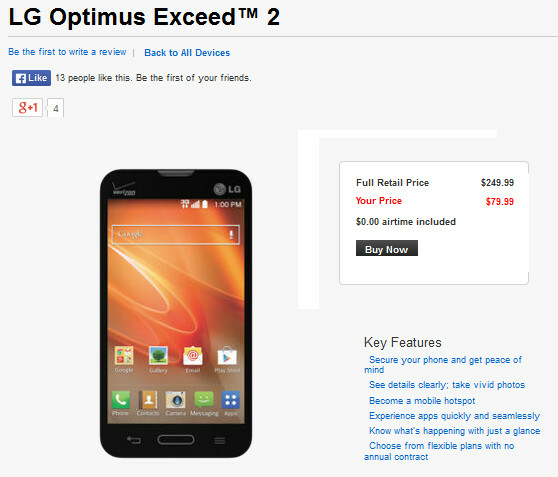 Two things that are wrong: 1) It is $79.99 at Vzw, and for some Best Buy's for $69.99. 2) There isn't a front facing camera. Actually, YOU are wrong. It does NOT have a front facing camera. The information provided on this website AND LG's website are false concerning the front facing camera. Not only do we own this phone, but we also reported the error on LG's website and they admitted it was a mistake. Do your research. You don't know why it doesn't show on the specs? because it's not there. Moron. A couple of people from howardforums that have the phone said that the one thing they are missing is the front facing camera. The LG L70 has a front facing, but that is available for Metrpcs.